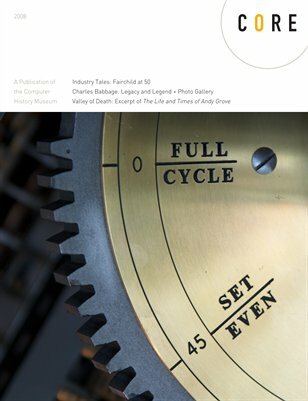 The Computer History Museum’s annual publication of the Museum has been distributed for nine years. It is a prestigious and scholarly representation of the Museum’s extensive computer artifacts collection the largest collection of computer artifacts in the world, encompassing computer hardware, software, documentation, ephemera, photographs and moving images. An educational resource for our members to provide context and insight into historical objects and stories. The 2008 issue of Core Magazine is highlighted with professionally taken, beautiful images of and from our collection, and three informative feature articles, written by curators or external experts. The issue includes articles on Fairchild’s 50th anniversary, images and background on our special Babbage Engine exhibit, and an excerpt from Harvard Business School Professor, and our Board Member & Resident Scholar, Richard S. Tedlow’s book on Intel’s Andy Grove.